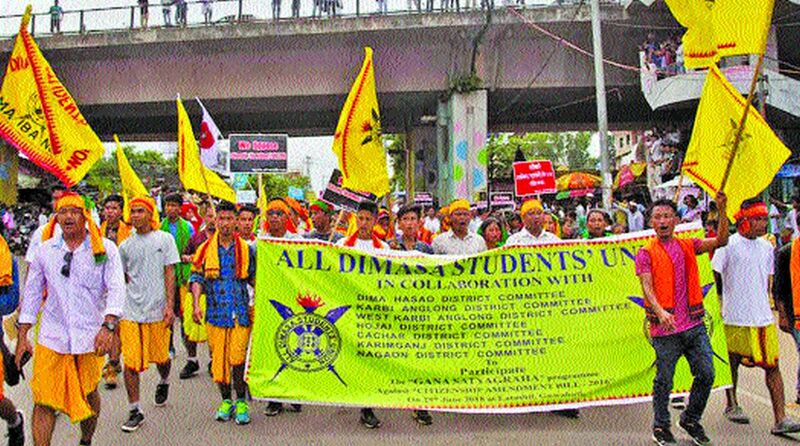 Citizens of India’s North-eastern states have been protesting vigorously against a proposed new citizenship regime that they claim will “destroy their culture” in the region. The protests have been diverse and dramatic — petitions, hunger strikes, effigy-burning, a rebel militant group threatening to end talks. The source of their anger is the Citizenship Amendment Bill, first tabled in the lower house of the Indian Parliament in 2016. It is set to change the Citizenship Act of 1955, which has formed the basis of India’s citizenship regime since it gained independence from the British Empire in 1947. The amendment seeks to allow select “persecuted minorities” (Hindus, Christians, Parsis, Sikhs, Buddhist and Jains) from the neighbouring countries of Bangladesh, Pakistan and Afghanistan citizenship status in India after six years of residency. Other groups must wait 11 years to become naturalised citizens. In the North-eastern states, the fear is that this amendment would legitimise migration of Hindus from neighbouring Bangladesh in particular, potentially affecting the demographic makeup of the region. When the bill’s parliamentary committee began touring the North-east in May, protests grew steadily larger, stronger and more widespread. As almost 99 per cent of their boundaries are international borders, the citizens of these states have been quick to point out that they would be the first “victims” of the new amendment if it makes it easier for minority immigrants to travel across the border, settle in and become full citizens. The complaints are loudest in the state of Assam, which has waged a four decade struggle to prevent what some there call “unchecked infiltration” from neighbouring Bangladesh. The committee’s decision to visit the North-east, and the media coverage of the protests, have framed this as a North-eastern issue, not a national concern. But in fact, the Citizenship Amendment Bill will change the character of citizenship not just for this region but for India as a whole. But, as historians such as Joya Chatterji and Ornit Shani have documented, there have been frequent challenges to the principle of citizenship by birth — especially in the period immediately after the partition of India and Pakistan in 1947. In contrast to Muslims, Hindus were from the start considered “natural citizens” of India. Muslim citizens of pre-independence India were ostensibly given a choice between the two countries, but in practice they were subjected to arbitrary processes to “prove” their loyalty to India. Similar demands were not made of Hindu citizens crossing the border from the newly-formed Pakistan back into India. Regardless of which states or regions would be most affected by a sizeable influx of migrants, the bill changes the character of Indian citizenship and the basis on which it is granted, moving from secular to overtly favouring specific groups — particularly Hindus. It opens the door for the creation of second-class citizenship for non-Hindus and most of all Muslims — not just in the extra-legal practices of discrimination and violence that exist today, but in the law. Given that India repeatedly fails its own minorities, perhaps it’s not surprising that it is only prepared to offer refuge and asylum on the basis of ethnicity, not humanitarian need. It’s no coincidence that this amendment was introduced by the ruling Bharatiya Janata Party, led by Prime Minister Narendra Modi, which has an abysmal track record in protecting India’s minorities, whether they are Muslims, Christians or Dalits. Nor has it shown any inclination to help rehabilitate south Asia’s largest persecuted minority, the Rohingya. Furthermore, the bill also leaves out Muslim minorities in Pakistan, such as Shias and Ahmadis. There is also speculation about whether the bill is a means to appease India’s Hindu diaspora abroad — an important funding base for the ruling party. Still, that the citizens of the North-east are protesting so vehemently — whatever their precise grievances — is currently the only sign of dissent. Unless it feels the heat of visible and vocal public outrage, India is likely to continue its slide towards becoming a very different, less inclusive, and increasingly more unjust country.